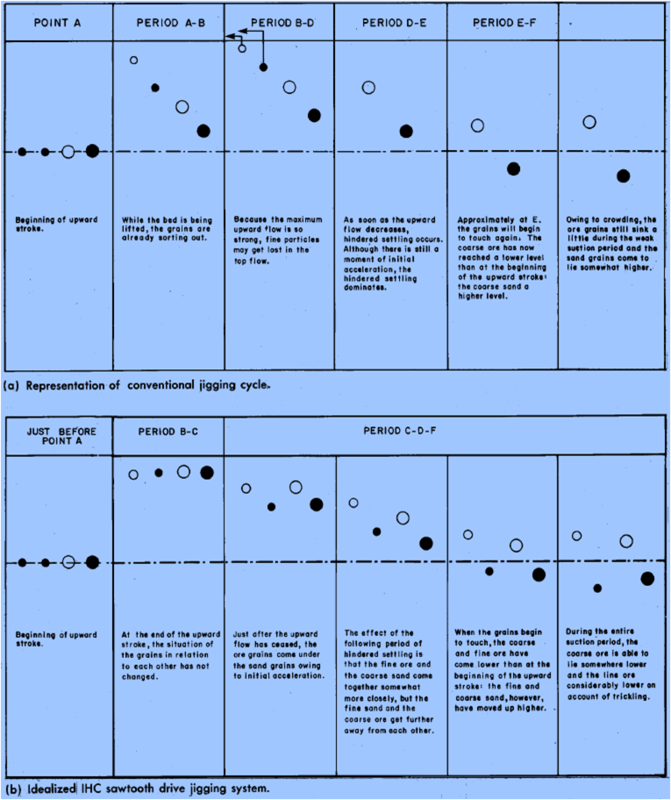 Jigging is one of the oldest methods of gravity concentration. The elementary jig is an open tank filled with water, with a horizontal metal or rubber screen at the top and a spigot at the bottom for removal of concentrate. The screen holds a layer of coarse, heavy material referred to as ragging. Ragging functions as a filtering or separating layer for heavy particles. 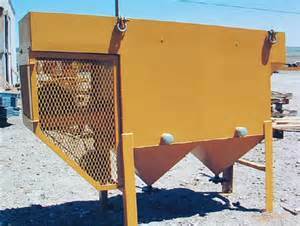 Initial feed forms a sand bed on the ragging which aids mineral separation. The ragging and the sand bed together are referred to as the jig bed. Mechanical plungers inside the tank cause the water to pulsate up and down. As the ore is fed over the ragging, the motion of the water causes a separation of heavy minerals in the jig bed. Heavy mineral grains penetrate the ragging and screen and are collected at the bottom of the tank, while lighter grains are carried over the jig bed with the crossflow. The conventional jig is a high capacity concentrator that efficiently separates material from I inch down to about 100 mesh (25.4 mm to 150 microns), although signficant recovery of gold finer than 230 mesh (roughly 70 microns) has been reported (Ottema, 1984, personal communication). Jigs can process 7-25 tons of material per hour, depending on their size, with recoveries of 80- 95%. 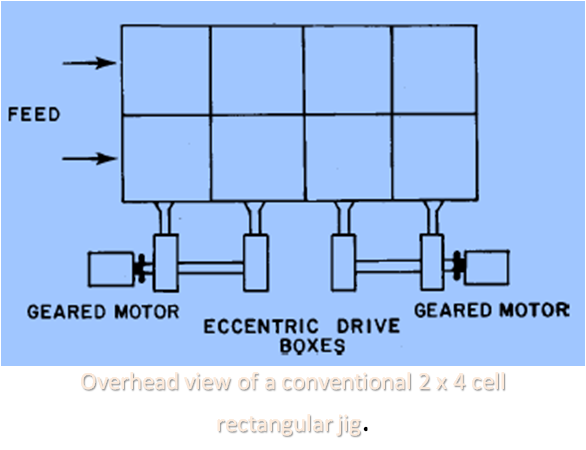 A usual configuration is a double line of four cells in series, each two cells driven by an eccentric box provided with a geared motor. These machines require a significant amount of floor space, head room, and experienced supervision. Nearly any fluctuation in feed size or rate will require the adjustment of the jig to maintain recovery. The actual mechanics of jigging are complex, and differing models have been developed to explain the process. Generally, the processes involved in efficient jigging are as follows. First, the compression stroke of the plunger produces an upward water pressure that causes the sand bed and feed to accelerate upward. Due to particle density, lighter particles are moved farther upwards than heavier ones. This process is called differential acceleration. Secondly, the mineral grains undergo hindered settling. 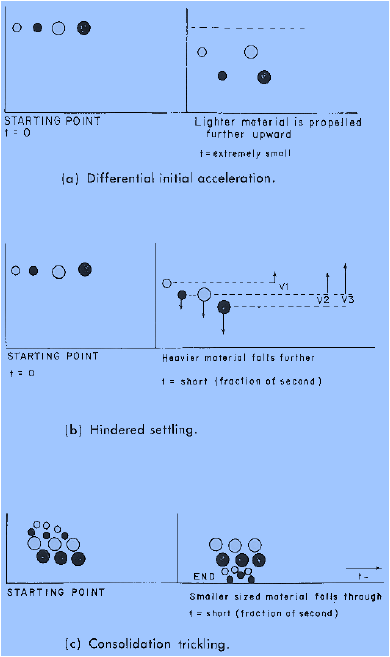 After the initial acceleration, the plunger stops and the mineral grains will fall and their speeds will increase such that the grains attain terminal velocity. Since the jig bed is a loosely packed mass with interstitial water, it acts as a high density liquid that restricts the settling of lighter particles while allowing heavy particles to fall. This allows heavy grains to settle further downward than lighter material. Finally, during the suction stroke of the plunger, a period of time is allotted for the fine grains to settle on top of a bed of coarse grains. The coarse grains have settled and are wedged against each other, incapable of movement. The small grains settle through passages between the coarse particles. The process is known as consolidation trickling. The entire sequence is outlined in. In a jig the pulsating water currents are caused by a piston having a movement with equal compression and suction strokes. At the point between pulsion and suction, the jig bed will be completely compacted, which hinders settling of all material. To keep the bed open, make-up water, referred to as hutch water or back water, is added. The addition of the hutch water creates a constant upward flow through the bed and thus increases the loss of fine material. 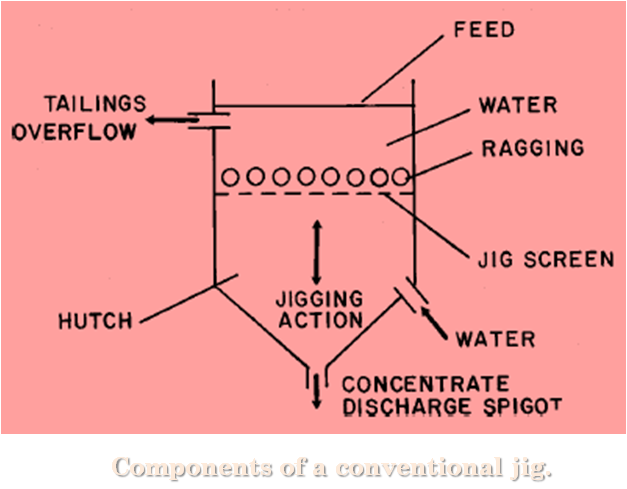 This loss occurs partly because the longer duration of the pulsion stroke acts to carry the fine particles higher and partly because the added water increases the speed of the top flow, carrying fine particles through the jig and past the jig bed before the jigging action can settle them out. The designs of conventional jigs differ mainly in the placement of the plunger and the jig bed and in where the make-up water enters the jig. One fairly recent innnovation in jig design is the circular Cleveland Jig, manufactured in Amsterdam and marketed by I.H.C. Holland. The major improvement, according to the manufacturer, is the development of a plunger with a short compression stroke and a long, slow suction stroke. This configuration modifies the jigging process as follows. First, a nearly instantaneous compression stroke brings all the mineral grains into motion as one unit. Mineral grains remain pressed together and are lifted up as a whole. Second, at the termination of compression, the upwards flow stops and downward acceleration with hindered settling occurs. This process only lasts a short time. Finally, the suction strike, although long, is weak, preventing the compaction of the bed. This allows ample trickling of the grains. As a result of this process, fine mineral recovery is enhanced. An additional advantage is that the need for hutch water is reduced and in some cases eliminated completely because the jig bed is kept open. Another innovation also developed by I.H.C. Holland is the modular jig. 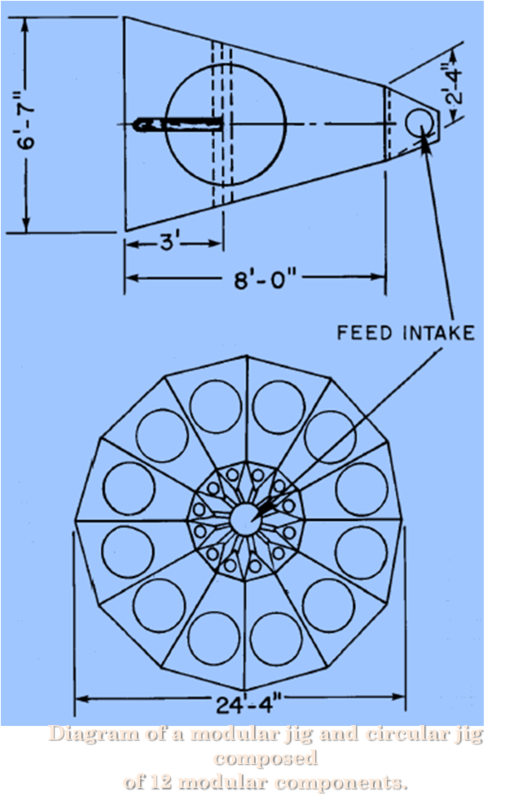 In a conventional jig, the addition of hutch water increases the velocity of the cross flow (the flow over the jig bed) and thus reduces the time heavy particles can be collected. One solution is to flare the square or rectangular tank into a trapezoid; in this way, the surface area of the flow is increased and its velocity is reduced. These modules are shaped so that they can then be combined to form a circular jig. Thus combined, they form a single unit with a very high feed rate and a single feed point, eliminating the need for the complicated splitting system usually required to feed a large number of jigs. Besides requiring less floor space and less water, these jigs offer increased recovery of fine gold. In addition, each module can be shut down for maintenance or repair independent of the others. These modular jigs can process up to 300 tons of material per hour. will clog the sand bed, reducing recovery. Slimes (particles less than 10 microns) should be controlled and trash and oversized material removed. Good ragging is essential for optimum performance. For gold recovery, steel shot or rebar from 1/4 to 3/4 inch is most commonly used. Generally, the heavier the ragging, the less concentrate collected; the larger the ragging, the more concentrate collected; and the thicker the ragging layer, the less concentrate collected. The sandbed should be checked for excess compaction during the suction stroke or excess dilation on the compression stroke. The addition of make up or hutch water should be carefully monitored because too much hutch water usually results in a loss of fines. Other factors that require at least initial adjustment are feed rate, length and duration of the plunger strokes, and the size and type of screening installed. Jigs are efficient, high capacity separation devices suitable for use as roughers and scavengers, and as primary cleaners. After initial setup, jigs require little adjustment and maintenance if feed rates remain stable. The continuous removal of concentrates is another advantage. Most important among the disadvantages is that jigs require intensive initial setup and adjustment. Experienced personnel are needed for setup and maintenance. A sizeable amount of floor space and large amounts of water are also required.